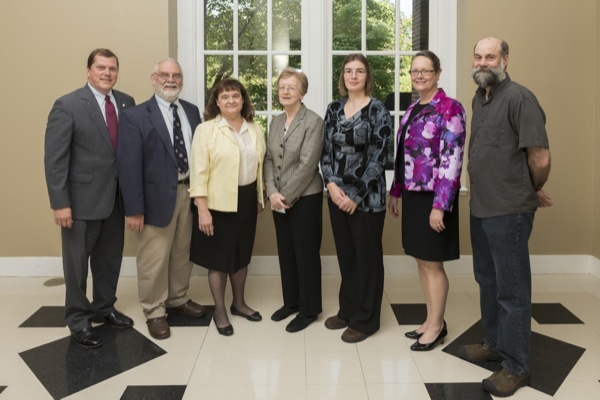 Pictured at the College of Arts and Sciences celebration are (from left) Dean George Watson and honorees David Smith, Florence Schmieg, Anne Boylan, Marianna Safronova, Audrey Helfman and David Meyer. Honored but not in the photograph was Richard Braun. Dean George Watson honors alumna Michele Hackley Johnson. Alumnus Steve Linberg speaks at the College of Arts and Sciences celebration. Alumna Carol Nigro speaks at the College of Arts and Sciences celebration. Alumnus William Oberlander speaks at the College of Arts and Sciences celebration. 8:55 a.m., May 22, 2013--The University of Delaware College of Arts and Sciences (CAS) held its annual awards ceremony on May 15 in the Roselle Center for the Arts to recognize its alumni award winners and college award recipients, and celebrate the notable faculty accomplishments of the past academic year, which included a psychology professor earning the Francis Alison Award, six named professors, and 20 promotion and tenure appointments. Dean George Watson recognized scores of individual faculty members and students for receiving prominent national and state awards, including two faculty Fulbright Awards, a National Science Foundation Faculty Early Career Development Award, Truman Scholarship, Goldwater Scholarship, and numerous other accolades from the past year. David Smith, professor of biological sciences, Lifetime Service Award. As associate professor of biological sciences and chair of the Health Sciences Advisory and Evaluation Committee for the past 15 years, Schmieg has provided sound support for students seeking careers in medicine, dentistry and other health professions. Her efforts have included the development of a detailed website guiding students through the four-year process of preparing for medical school, as well as organizing and overseeing the efficient operation of the HSAEC evaluation process. Boylan is professor of history. She has held numerous appointments across campus, from chairing the Undergraduate Studies Committee, to serving on the CAS Strategic Planning Committee, Women’s Studies Program Executive Committee and search committee for numerous faculty appointments. At the University level, she practices mock interviews with potential Truman, Goldwater and Marshall scholars and has worked with UD-ADVANCE to implement an NSF grant to improve recruitment and retention for female faculty in the sciences, engineering and math. Braun is professor of mathematical sciences whose major research contribution is using math to address questions in tear-film dynamics, which is required for overall eye health. He frequently and extensively collaborates with scientists outside his field and has authored or co-authored 60 publications, with some of his articles cited more than 700 times. He has presented his work at seminars and lectures across the world and received 12 scientific awards for his scholarship. Safronova is associate professor of physics and astronomy whose research is in the field of high-precision theoretical and computational studies of atomic properties. 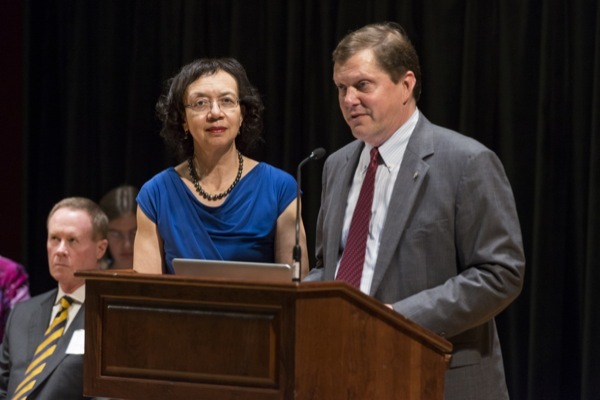 Since her promotion to the rank of associate professor in 2008, she has published 39 peer-reviewed papers in leading journals, with a citation record exceeding 100 per year. She has given over 100 talks and was elected Fellow of the American Physical Society in 2011. In 2012, Safronova received the Woman Physicist of the Month Award and she was most recently elected Fellow of the Joint Quantum Institute. Meyer teaches and oversees the sculpture program in the art department. His work explores various concepts associated with experience and ranges from site-specific installation art, to large-scale outdoor commissions, to simple objects that compel a second look. “He brings a personal yet professional touch to the studio, patiently sharing his time, knowledge, wit, and creativity with his classes across the sculpture curriculum,” his nominators write. “He listens to his students, provides support, and challenges them at the same time." 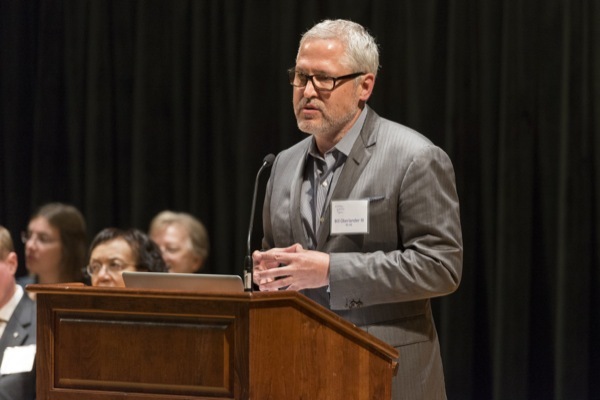 Helfman is associate professor in the School of Public Policy and Administration and leadership director of the Middle East Partnership Initiative program. She has led numerous study abroad programs across the world, exposing students to “small, out-of-the-way villages” in countries such as Ethiopia, Morocco, India, Thailand, Vietnam and Laos. “These lucky UD students return as better people, as global citizens aware of global realities, and much more eager to volunteer and to help lead others to do the same,” write colleague and political science professor James Magee. Helfman will retire from the University this year. Smith is professor of biological sciences. He came to UD in 1975 and has since chaired most of the departmental committees at some point. He has served on the College and University senates in many capacities, and was vice president of the College Senate and is a past president of the University Senate. Smith has guided numerous faculty in teaching and research mentorship and instituted a model for undergraduate student advisement that has become recognized across campus as a model for the University. 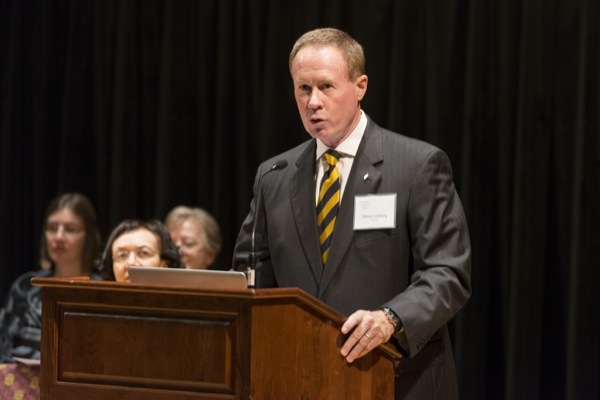 “His service to the University has increased the educational experience of students, strengthened the faculty’s role in the University and helped educate the citizens of the Delaware Valley,” wrote his department chair Randall Duncan. Smith will retire from the University this year. Michele Hackley Johnson, a 1975 graduate, who serves as director of interventional neuroradiology and associate professor of diagnostic radiology, surgical otolaryngology and neurosurgery at Yale University. Steve Linberg, a 1973 graduate, who has worked for more than 30 years in academic clinical research and drug and biologics development, with particular experience in directing overall drug development programs and individual clinical trial design. 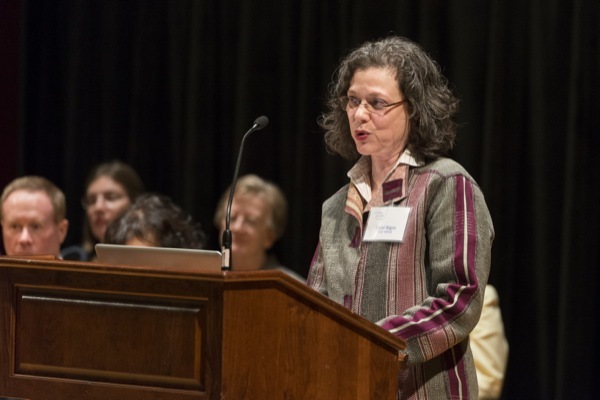 Carol Nigro, who received a master’s degree in 1997 and a doctorate in 2009, and who collaborated with UD faculty, alumni, and supporters to form the Friends of Art History, a fundraising and advocacy group that promotes the study of the visual arts at UD. William Oberlander, a 1981 graduate, who serves as managing director for marketing, communication and events for the Robin Hood Foundation, the largest, most aggressive poverty-fighting organization in New York City.